Bob Holmes – 15 Pound 3 Ounce Lake Record Hybrid! Experience the DIFFERENCE with the #1 Guide on Richland Chambers Lake! Whether you want to chase the “sandies” or feel the tug of a big hybrid bass, you’ve come to the right place for the experience of a lifetime. 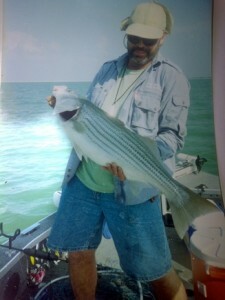 I have over 23 years fishing experience and vast knowledge of Richland Chambers Reservoir, which is 17 miles east of Corsicana , Texas, on Hwy 287 south. I also guide on Cedar Creek Lake. As a professional guide specializing in sandbass and hybrid bass, I am dedicated to giving you the best in service, hospitality and sharing my respect for the natural beauty that is Richland Chambers Reservoir. I have the equipment and expertise to handle large corporate or family groups down to the single fisherman. Bob Holmes Guide Service uses only top of the line equipment and I want to give you everything you’ll need to land that prize that will be the topic of stories for years to come. We offer all the instructional guidance you need – no fishing experience required! “It was definitely worth the drive from Little Rock to fish on Richland Chambers with Bob. I’ve never caught so many fish on one trip in my life! Save me a spot in the fall Bob!